This is the latest accepted revision, reviewed on 20 January 2019. For the magazine, see Truckin' Magazine. 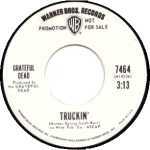 "Truckin'" is a song by the Grateful Dead, which first appeared on their 1970 album American Beauty. It was recognized by the United States Library of Congress in 1997 as a national treasure. The song's climactic refrain, "What a long, strange trip it's been", has achieved widespread cultural use in the years since the song's release. "Truckin'" is associated with the blues and other early 20th-century forms of folk music. "Truckin'" was considered a "catchy shuffle" by the band members. Garcia commented that "the early stuff we wrote that we tried to set to music was stiff because it wasn't really meant to be sung ... the result of [lyricist Robert Hunter getting into our touring world], the better he could write ... and the better we could create music around it." The communal, shared-group-experience feel of the song is brought home by the participation of all four of the group's chief songwriters (Garcia, Weir, Lesh, and Hunter), since, in Phil Lesh's words, "we took our experiences on the road and made it poetry," lyrically and musically. He goes on to say that "the last chorus defines the band itself." The single version of "Truckin'" as a B-side to "Johnny B. Goode" from 1972. The song was taken from the American Beauty album and edited down in length from five to three minutes for release as a single. In addition to being shorter, the single version had some audible differences compared to the album version: it featured sections of lead guitar in places where it's faded down on the album version, a heavy processed effect on Bob Weir's lead vocals in the verses, a different vocal track for the "Sometimes the lights..." portion, and is missing the album version's organ part. The single reached number 64 on December 25, 1971 on the U.S. Pop Singles chart and stayed on the chart for eight weeks. "Truckin'" was the highest-charting pop single the group would have until the surprise top-ten performance of "Touch of Grey" sixteen years later. Moreover, the album track was heavily played on progressive rock and album oriented rock radio stations and accordingly helped popularize the group among general rock audiences. "Truckin'" debuted as the first song on the first set on August 18, 1970 at the Fillmore West in San Francisco, the same performance where many of American Beauty's songs premiered. A longer rendition, that turns into a jam, was included on the popular 1972 live album Europe '72 segueing into "Epilogue", followed by "Prelude". Over the band's long concert career, "Truckin'" was performed 520 times, making it the eighth-most performed Dead song. ^ "Johnny B Goode / So Fine, Grateful Dead / Elvin Bishop Group". Retrieved April 4, 2016. ^ a b Grateful Dead: The Illustrated Trip . Jake Woodward, et al. Dorling Kindersley Limited, 2003, pg. 112. ^ Emblematic of the Grateful Dead sound that gained them four albums in the Rolling Stone 500 greatest albums list within the 1968-1970 period, a list they did not appear on again. ^ Lifton, Dave (2015-01-31). "45 Years Ago: The Grateful Dead's Infamous 'Truckin' Drug Bust". Ultimate Classic Rock. Retrieved 2017-04-16. ^ "The Annotated "Truckin'"". Arts.ucsc.edu. Retrieved 2016-10-03. ^ Jazz Dance: The Story of American Vernacular Dance by Marshall Stearns and Jean Stearns, Da Capo Press, 1994 ISBN 0-306-80553-7. ^ Garcia: An American Life by Blair Jackson, Penguin Books, 1999, pg. 197. ^ Phil Lesh: Searching for the Sound by Phil Lesh, Little, Brown and Company, 2005, pg. 191. ^ Deadbase X: The Complete Guide to Grateful Dead Song Lists by John W. Scott, Mike Dolgushkin, Stu Nixon, Deadbase, 1997. ^ "Grateful Dead - Chart history". Billboard. Retrieved 2016-10-03. ^ Budnick, Dean (April 7, 2017). "Howard Wales on Jerry Garcia, Hooteroll? and Beyond". Relix. Retrieved November 2, 2017. This page was last edited on 20 January 2019, at 10:31 (UTC).